Bill Kaulitz: Bill Kaulitz protagoniza el "Look of the day" en "L´Uomo Vogue Italia." Bill Kaulitz protagoniza el "Look of the day" en "L´Uomo Vogue Italia." 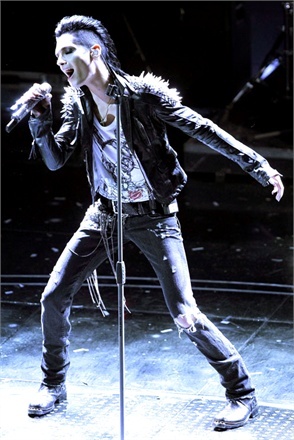 Living fully has always been the only possible option for Bill Kaulitz. At 12 he formed the band Devilish with his twin brother Tom and friends Georg Listing and Gustav Schafer. In 2001 the band catches every opportunity to perform and it‘s thanks to their perseverance that in 2003 talent scout Peter Hoffman discovers them. He changes the name of the band in Tokio Hotel and obtains a record deal with Universal. Their latest single Hurricane and Suns is the bonus track of their album Best Of, released in late 2010, which contains all their greatest hits. The album was released in three versions: Inglese Version, German Version and Deluxe Limited Edition. Bill Kaulitz, who is adept of a very dark color palette, is inspired by the looks of the great rockstars of the past when it comes to his wardrobe. To perform on stage he never gives up metal studs and heavy eyeliner, for social events he remains true to his rocker DNA, always opting for slim trousers preferably in leather, biker jackets or blazers sharply cut and boots. The military-inspired navy blue cashmere coat by Burberry Prorsum and the Frankie Morello tank top are perfect for him. To achieve a style a little less sui generis the minimal cotton shirt by Calvin Klein and a pair of washed jeans like the ones by Desigual or the parka in soft fabric by Emporio Armani.